What Can You Do with This Fitness Tracker? How to install APP and connection? Step1: Download "iband" APP from APP store.Or Scan QR code on the product manual. Step2: Open APP enter "Setting"→"Device connection"→Search Bluetooth and complete connect, to keep cellphone's bluetooth on when they are connected；Or on the "step" interface,press the touch button for long time,product two-dimensional codes connected by blue-toothin this bracelet.Click the function of scanning code,scan two-dimensional code displaying on the bracelet,then you can use the fitness tracker after connect. 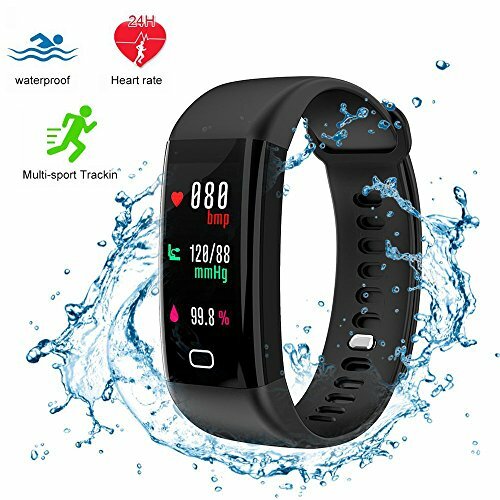 ----> WATERPROOF BLUETOOTH PEDOMETER -- waterproof allow you washing hands, getting caught in the rain. The wristbands are easy to install and disassemble to meet your needs and bring you high quality comfort life. ----> WIDELY COMPATIBLE -- Bluetooth 4.0 Support IOS 7.1 or above ; Android 4.4 or above. (iPhone 5/5S/5C, iPhone 6/6S plus,iphone 7/7 plus etc. ); Please Download APP "iband" from Store. Smart phone only, not for PC). ----> EASY TO CHARGER -- Wireless USB Charging can be removed off the strap and recharged from any 5V/1.0A USB power supply. High quality polymer rechargeable battery guarantees long battery life: about 7-10 days standby time/4 days operating time. ----> CONVENIENT AND EFFICIENT LIFE COMPANION: Built-in USB design, avoid the awkwardness of forgetting to carry a charger for long trips.Fast fully recharge nly about 1 hour and the standby time can be 5-7 days.Multi-function reminder which include income calls,message and SNS notification,never miss any call or message. If you have any questions about this product by BAIZE, contact us by completing and submitting the form below. If you are looking for a specif part number, please include it with your message.